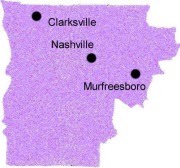 Area II covers these counties in Middle Tennessee: Cheatham, Davidson, Dickson, Hickman, Humphreys, Houston, Jackson, Lewis, Macon, Marshall, Montgomery, Perry, Robertson, Rutherford, Smith, Stewart, Sumner, Trousdale, Wayne, Williamson and Wilson Counties. All of the clubs in Area II belong to the Cumberland Valley Western Square and Round Dance Association, Inc. Monthly meeting are held at 6:30 p.m. on the second Wednesday at the Piccadilly Cafeteria, 874 Murfreesboro Road, Nashville, TN. The meeting is open to everyone. We are fortunate to have the support and participation of the Nashville Area Callers Association (NACA) in our Association. Their current president is Ken Diesburg, 5819 Foothills Drive, Murfreesboro, TN 37129, Phone (615) 895-2933, email: kjdeg@comcast.net. The newsletter for CVWS&RDA is “Happy Tracks” published monthly. For information about subscribing to “Happy Tracks”, contact the editor at PO Box 21, Gladeville, TN 37071 or e-mail happytacks.tn@gmail.com. Cost of annual subscription is $10.00 for email PDF version or $15.00 for usps mailed hard copy version. Area II clubs are listed below. Check their websites (where available) or call or email the contact to ensure the dance has not been cancelled for some reason.